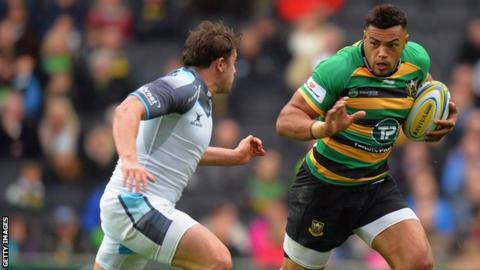 Northampton Saints secured their first Premiership win of the season with a bonus-point victory over Newcastle Falcons at Stadium MK. Christian Day's try gave Saints a 16-9 half-time lead, with three Mike Delany penalties keeping Falcons in touch. But Northampton pulled clear after the break, as Day, Luther Burrell and Ben Foden all crossed in the space of 10 minutes to secure the bonus point. Newcastle's Tom Penny pulled one back, but Foden's second try wrapped it up. Saints, who suffered a shock defeat by newly-promoted Worcester Warriors on the opening night of the season, looked to have put that disappointment behind them with a blistering opening quarter against Falcons, during which Day opened the scoring. But former All Black Delany kicked three penalties to keep Newcastle in touch, as Northampton failed to find their rhythm in front of more than 20,000 people in Milton Keynes. Their class did tell, however, after the break as Day crossed behind a rolling maul, Burrell scored a smartly taken try and Foden ghosted through a gap to wrap up a bonus point. Replacement Penny offered Newcastle a brief reprieve with a consolation touchdown but Foden, who was omitted from England's World Cup squad, completed the scoring late on. "We know Ben Foden is a good player. He needs games to get back to full fitness. "He was playing well when he got injured last season. Fingers crossed we can keep him fit. He had an excellent game, even in the first half when we were under the cosh he was doing well. "We were really disappointed with last week, but we regrouped this week and managed to get a bonus-point win. We are back on track but now we need to back this win up." "They scored twice during the sin-bin period. We shouldn't be conceding penalties like that and we shouldn't be conceding tries like that. "But it is symptomatic of where we are at the moment. Some players don't react to how the referee is refereeing. "You have to be on your mettle and not give the referee anything. You can't blame the referee at all. As an away side you know what you are up against and so you have to be whiter than white - we didn't get the rub of the green." Northampton Saints: Foden, K Pisi, G Pisi, Burrell, Elliott, Myler, Dickson (capt), Waller, Hartley, Brookes, Lawes, Day, Gibson, Wood, Dickinson. Replacements: Haywood, E Waller, Hill, Paterson, Fisher, Fotuali'i, Hanrahan, Tuala. Replacements: McGuigan, Fry, Vea, Botha, Welch, Dawson, Catterick, Penny.